#1 Bestseller! SPEAK ENGLISH LIKE AN AMERICAN: Learn the Idioms & Expressions That Will Help You Speak Like a Native! What's the secret to speaking English better? It's mastery of those tricky idioms and phrases that are so common in English. And learning these idioms and phrases will not only help you speak better, it'll help you understand Americans better. In this course, you'll join an American family as they go about their day-to-day lives. Along the way, you will master over 300 of today's most common English idioms and expressions! Speak English Like an American is one of the world's most popular books for learning conversational English. It's now in its sixth edition. Discover why thousands of students from all corners of the world are turning to Speak English Like an American to improve their everyday English skills...these bestselling book & CD sets are a fun and effective way to improve your English! Ideal for both self-study and classroom use. Now in use in ESL programs at universities throughout the USA, including Yale University and Drexel University. 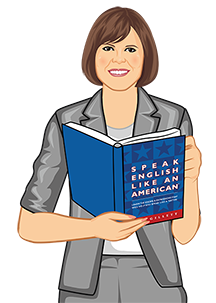 Speak English Like an American and author Amy Gillett were featured on CBS Radio! Listen to the interview here. Now ALSO available as an app! "A highly recommended self-teaching tool for those who are familiar with the English language, yet who seek to take their fluency to new heights by mastering common English idioms. Over 300 of the most-used American English idioms and phrases are presented, complete with examples, definitions, and engaging dialogues that serve to tell an entertaining family story punctuated with amusing cartoons." "A great source for ESL students like me to help me know when, how and where to use these idioms in the right situations. Moreover, the CD's pronunciation is perfect! Couldn't say anymore. If you practice these idioms daily, I am sure you would see how well it works. I would recommend to my friends and people whose English is the second language. Good luck!" "I just finished studying Amy Gillett's "Speak English like an American" book and CD. This book was one of the greatest English language books I ever studied. I loved the way the book was written — it is very fun and very easy to learn because of how the conversations are written..."
"This is an excellent book and CD to acquaint beginners with many American idioms.The way it is put together so coherently in short stories makes it simple to learn but at the same time efficient. The CD is also very well done. Even advanced students of English as a second language can find something to learn here." Amy Gillett is the author of the bestselling books Speak English Like an American, More Speak English Like an American, and Speak Business English Like an American, Speak Better Business English and Make More Money, and Speak English Around Town. She has taught English as a Second Language (ESL) and Business English in Europe and in the United States and now she’ll teach you. With this book and CD, you can take her classroom with you! Amy has an MBA from Cornell University, along with degrees in foreign languages and literature from Stanford University. One of the world's leading experts on American English idioms, she was quoted in the Wall Street Journal on usage of American slang and idioms.